The chancellor's capitulation spells bad news for the UK's troubled relationship with the EU. George Osborne has dropped his challenge to the EU cap on banker bonuses after the European court’s legal adviser pretty much said it was doomed to failure. A humiliating climbdown at the hands of an institution the Tories love to hate, but not an entirely unforseen one. The cap restricts bonuses to 100% of bankers’ pay or 200% with shareholder approval. But critics, including Bank of England governor Mark Carney, have pointed out that banks are just increasing salaries and ‘fixed allowances’ (non-variable pay top-ups that the EU also wants to clamp down on). That, the argument runs, could actually pose more of a danger to financial stability, as bankers won’t get penalised for performing badly. Can’t win eh. ‘I’m not going to spend taxpayers’ money on a legal challenge now unlikely to succeed. 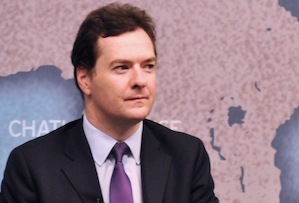 The fact remains these are badly designed rules that are pushing up bankers’ pay not reducing it,’ Osborne said. It’s not a good day for the chancellor, who also faces a looming hole in the public finances - borrowing was £64.1bn in the first seven months of the financial year, £3.7bn higher the same period last year, the Treasury announced today. But it’s not particularly good for the EU either. The European Court of Justice was never likely to rule in Osborne’s favour - no one likes backpedalling, although even , the court’s legal adviser who recommended it shoot the UK’s challenge down, admitted the caps meant higher salaries (equally, no one’s really figured out the best way to stop bankers betting the farm). But with UKIP triumphant in Rochester and Strood today, the EU needs to give the UK government a reason to cheer about it. Otherwise, beware a Brexit.